For more than 100 years, print was the foundation of destination marketing. The Official Visitor Guide is almost as old as DMOs, which trace their origins back to the earliest convention and meetings bureaus set up in the late 1800s. Visitor guides published by cities, states and countries became a staple of visitor planning in the years after World War II — marketed via print or television advertising and a toll-free number available for consumers to order the guide. Orders for visitor guides became a major metric against which DMOs measured success in their marketing and campaign activity. Here at Miles, our origins as travel marketing experts go back 60-plus years. In the early decades of our company, print formed the primary way in which destinations presented and delivered travel information and content to prospective visitors. Early visitor guides first focused on major exhibitions and events (such as this San Diego guide of 1915 about a major exposition celebrating the opening of the Panama Canal). 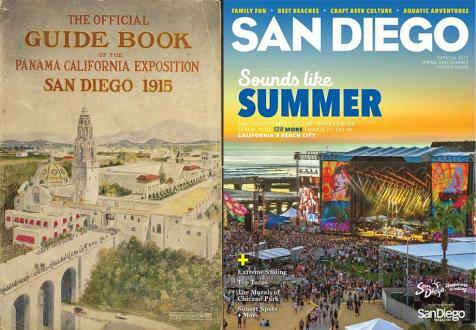 More than 100 years later, the decedent of the organization that helped organize that event, the San Diego CVB, still publishes a range of print visitor guides. The dominance of print in destination marketing was slowly but fundamentally transformed by the commercialization of the Internet. Right from the very early years of the publically available Internet from the mid-1990s, Miles has also become an expert in digital marketing. In 1996, we developed our first destination website — the first state tourism website for VISIT FLORIDA. As digital marketing channels have grown in both prominence and usage, we have continually re-assessed the role and relevance of print in traveler planning and decision making – and how it works with digital media. While some in the tourism industry have doubted the continued impact of print in a more digitally centric tourism marketplace, we have always tried to take a clear-eyed, objective look at what the research and data is saying about the continued relevance of print. To this end we have just published a new white paper, “The Value of Print,” on what independent research says about the usage of print in travel and tourism in 2017 and for the next few years. At Miles, all our research is from independent, specialist research companies with which we partner for objective insights on travelers and their media use. In this case, the white paper summarizes research from Destination Analysts, Longwoods, IPOS and more. We looked at a wide range of research and summarized the latest findings and insights on the role, reach and impact of visitor guides. 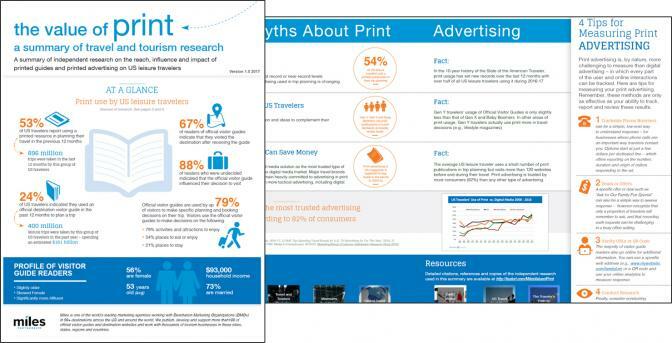 In addition to debunking myths and outlining the research-based truths on the reach and influence of print in visitor planning, this white paper provides a guide to effective print advertising creative and tips for measuring print advertising. Chris has more than 15 years working with destinations in the U.S., New Zealand, Australia and the UK. He is responsible for keeping Miles and our clients in tune with the latest trends, research and analytics in travel. He provides strategic recommendations based on that research and data, and his depth of understanding of online marketing means Chris is in demand at tourism technology and research conferences.